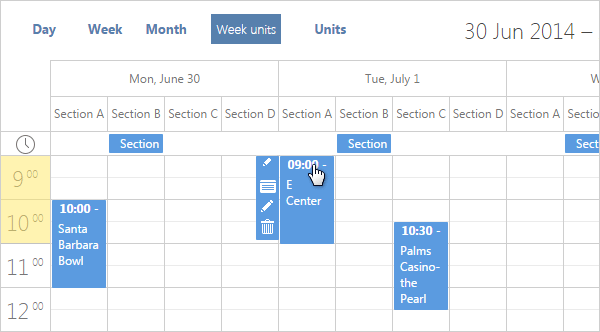 This update introduces a long-awaited and cool ability to display multiple days in Units view. So now, using the days parameter, you can display even the whole week (or any number of days) divided into the sections. A new way to present data in Timeline view is added in dhtmlxScheduler v4.3. You can display the days instead of sections. It gives you the ability to show entire several days instead of some parts of them. What else is new in dhtmlxScheduler 4.3? Fix for an issue with creating new events on touch devices in the Timeline view. Also this update includes fixes of compatibility issues with dhtmlxSuite and other small improvements. Check the full list of changes and the details in our documentation. Please note that the licensing and editions terms has also been changed. You may find the license details here. You can download the Standard Edition of dhtmlxScheduler here. The PRO users with active support subscription will receive the updated version via email. Thank you guys!! This new week unit view looks great!